Armed with a strange dagger, a young girl begins an adventure beyond fear. Slavers seize stronghold first daughter Kyrin Cieri from the coast of medieval Britain and sail for Araby. With a dagger from her murdered mother’s hand, an exile from the East, and a peasant girl, Kyrin finds mystery, martial, skill, and friendship closer than blood. The falcon dagger pursues her through tiger-haunted dreams, love and war in the Araby sands. Caught by the caliph’s curt intrigue, Kyrin faces the sword that took her mother. She must find the heart of the falcon for the will to overcome, justice against hate, dagger against sword, slave against master. 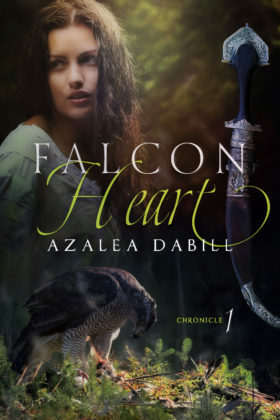 Book 1 of the Falcon Chronicles series.